Man, I slept hard last night! I like having a white noise to sleep and the ocean was perfect! It was calm and cool all morning. We all had some condensation, but not too much. We had about 8mi of beach walking to go to Shelter Cove and it was a high tide area. We had plenty of time, but it was fun to have the tide coming in as we hiked. It randomly pushed higher and we’d run up as the foam nipped at our feet. A couple of times, Drop-N-Roll didn’t make it in time and got some wet feet. 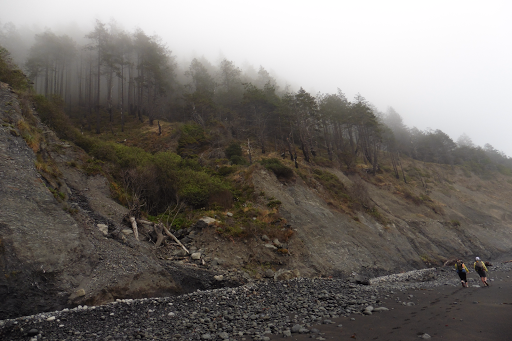 The hiking was a mix of sand and small pebbles…pretty uneventful and the fog didn’t lift, but we enjoyed having a unique climate from yesterday. We did see some other hikers and even little bear footprints. No bear sighting, but they’re definitely out here and it’s understandable that bear cans are required in this northern section. 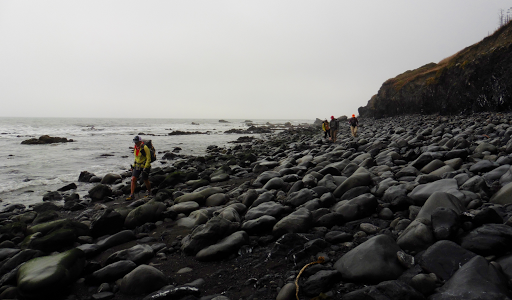 We hit Shelter Cove, sorta the halfway point, just about 24hrs after we started. We were happy to get a change from the sand walking, but weren’t too excited about the ~3.5mi road walk through Shelter Cove. It connects the north and south trails and gains ~2000ft. Few people connect the two trails like this and walk the road. 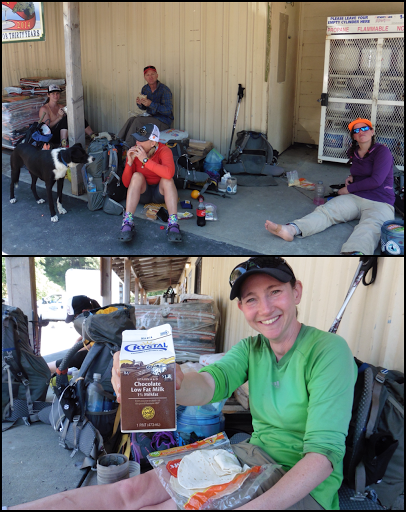 We took some time at the trailhead reveling in the water fountain and flush toilets. As we started the climb up the road, the fog began to lift and the heat increased quickly to the 80s. The road was narrow, winding, and had fairly frequent fast moving traffic. As we hiked higher, the shade lessened and it got pretty hot. 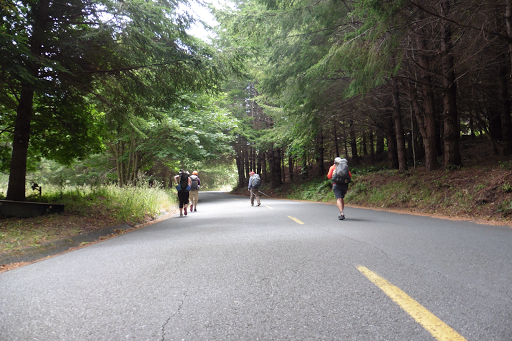 There was discussion of hitching since it was a fairly ridiculous road walk. Just as we started to accept that there wouldn’t be any food stores along the way, a sign for the general store magically appeared about halfway up the road walk. It immediately lifted our spirits, and we had lunch outside the store. Everyone got little treats that they were craving…I ate my packed lunch of two tortillas with tuna and string cheese, and got some nice cold chocolate milk and some Oreos for dessert. It was a fun lunch. As we sat there, we saw many trucks drive up and most seemed to know what we were doing. One asked LoveNote if we wanted a ride to the top of the road climb and she turned them down since we had just arrived. We did not solicit a ride as we are, but it was tempting. The final decision by the end of lunch was that Dan would stick a thumb out if a truck happened to be going our way. About half a mile from the store, a woman in a truck drove by. She made eye contact with Dan and was pulling over before he even tried to hitch. 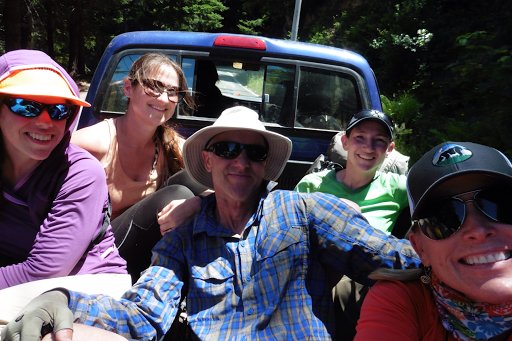 We all jumped in the back of the truck and got a ride the final mile up the road…and that’s the story of my first yellow blaze (skipping miles by hitching). Not sure I feel all that great or proud about it, but it’s what happened and it was entertaining. So there you have it. I’ve finally yellow blazed! 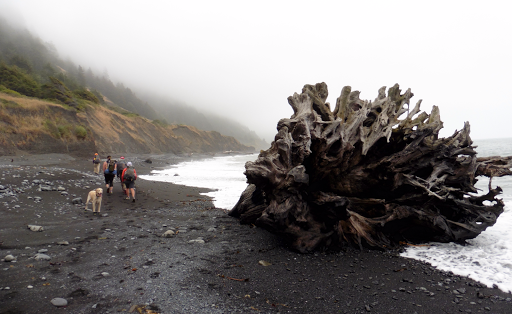 The southern half of this trail is much less known as part of the Lost Coast Trail. Most hikers only hike the northern beach section. The southern section is mostly wooded and well above the ocean with a lot more up and down. Here is an elevation chart I found on a Lost Coast website to get and idea of how different the two sides of the trail are. We are camped just before Needle Rock. We hiked the rest of the day in the woods well above the ocean. It was drier and not what I envisioned. The LCT has been fun, but after all the hype this trail has gotten, we all honestly feel like it is over hyped. It’s a lot of effort to get to this remote spot and we had high hopes. It wasn’t as rugged and slow going as we heard either. Please take into consideration that this group is a different breed from the common weekend backpacker. 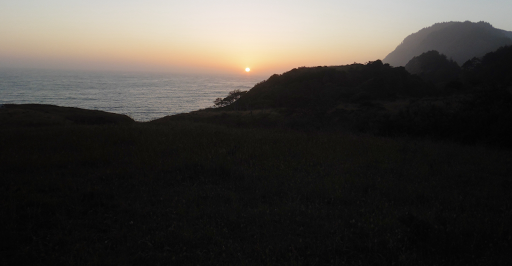 We like doing full days and hiking most of the day, so our mileages will be higher than most hikers. I’ve backpacked on the West Coast Trail on Vancouver Island, the Olympic Coast in Washington, and a bit of the Oregon Coast Trail. 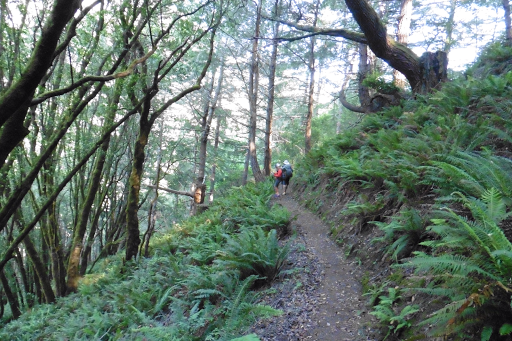 I’d recommend any one of those trails over the Lost Coast so far. 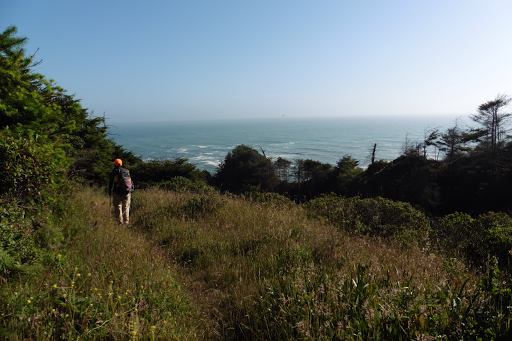 The last few miles today were more of what we envisioned….green forests, tall trees, ferns, and grand views of the coast. Don’t get me wrong, we don’t dislike this trail. 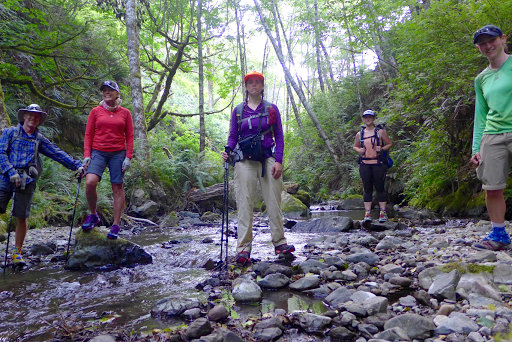 We all love the hiking…we just expected more from what we heard. We finished the day about 6:30pm at Jones Beach Campground. A nice space up on the shore cliffs and we can hear the waves in the near distance. 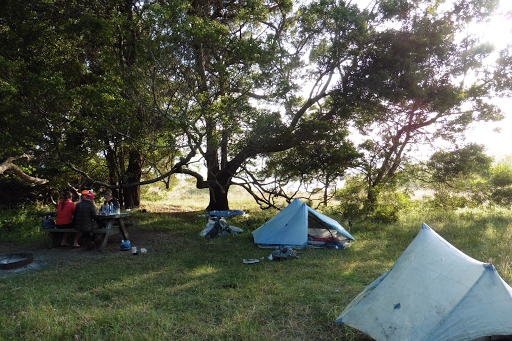 We were happy to have a picnic table and pit toilet at camp. It’s much cooler than last night and things are already damp from the ocean air. Again, I’m dozing off and will wrap this up now. Good night!